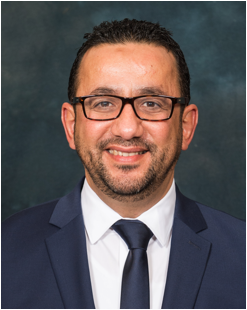 Dr. Brahim Medjahed is Associate Dean of Academic Programs and Initiatives at the Rackham Graduate School, University of Michigan, Ann Arbor. He is also Professor of Computer Science at the University of Michigan – Dearborn. He received his PhD in Computer Science from Virginia Tech, USA in 2004. He received several prestigious awards including three (3) best research paper awards, the University of Michigan – Dearborn Distinguished Teaching award, the College of Engineering and Computer Science (CECS) Excellence in Teaching award, and the Outstanding Graduate Research award at Virginia Tech. His research focuses on advancing the state of the art in managing service-oriented software. In particular, he is interested in exploring solutions for service integration in emerging environments such as cloud computing, the Internet of Things, big data, mobile computing, and crowdsourcing. His research is funded through multiple grants from federal agencies (e.g., the National Science Foundation) and industry. Dr. Medjahed has more than 100 publications in premier journals and highly competitive conferences. He also has two (2) books published by Springer. o Ph. D. in Computer Science, Department of Computer Science, Virginia Tech. o M. Sc. in Computer Science, Algiers University of Sciences and Technology (USTHB). o B. Sc. in Computer Science, Algiers University of Sciences and Technology (USTHB). o Service Computing, Cloud Services, Data Integration, Privacy and Trust, Ontology. o Trevor O. Jones Outstanding Paper Award, SAE World Congress Experience, WCX19, Detroit, April 2019.
o Distinguished Teaching Award, University of Michigan – Dearborn, 2018.
o Excellence in Teaching Award, College of Engineering and Computer Science, 2018.
o Ford Faculty Summer Internship Award, Summer 2017.
o Best Student Paper Award, IEEE International Conference on Web Services, ICWS 2015 (17% acceptance rate). o Best Paper Award (Wilkes Award), The Computer Journal, 2008 (one of the longest established journals in computing). o Outstanding Graduate Student Award, Department of Computer Science, Virginia Tech, 2004. Developing Advanced Privacy Protection Algorithms for Connected Automotive User Experience, Amount: $191,154. 04/2016 – 03/2018. B. Medjahed and D. Ma. Faculty Internship Award, Ford Alliance Program, Amount: $10,000. Summer 2017. B. Medjahed. A High-dimensional Multi-level Framework to Improve Software Quality. Amount: $10,000, 12/2013 – 09/2014. M. Kessentini (PI), B. Medjahed, K. Deb. SYNCLet: Mobile Phone Extensions for Vehicle Appropriate Use, Amount: $25,000. From 10/2009 to 01/2010. B. Medjahed and Paul Watta. A Self-Healing Approach for End-to-End Change Management in Dynamic Service-Oriented Systems, Amount: $45,402. From 09/2008 to 08/2010. B. Medjahed. A Workflow System for Brake Instability Analysis. B. Medjahed (PI). Amount $3,000. From 02/2008 to 04/2008. ITEST Program. Fostering Interest in Information Technology. M. Duran (PI), M. Hoft, B. Medjahed, E. Orady, and P. Zitsewitz. Amount: $900,000 (personal share: 20%). From 09/2007 to 08/2010. The Professional Mentoring and Networking Program for Women in Engineering. J. Cristiano (PI), B. Medjahed (Senior Personnel with 6 other Faculty from UM-Dearborn). Amount: $349,305. From 09/2008 to 08/2009. Chamaeleo: Self-Managing Changes in Dynamic Service-Oriented Applicationss. B. Medjahed. Amount: $17,000. From 05/2007 to 05/2008. Developing In-Vehicle Database Management Techniques for Efficient Vehicular Applications. Q. Zhu (PI), B. Medjahed. Amount: $53,000. From 05/2005 to 08/2007. 1) A. Cherouane, L. Mahdaoui, L. Bellatreche, B. Medjahed. A Semantic Approach for Generating Government Processes. International Journal of Web and Grid Services. 15(1), pp. 59-92, January 2019. 2) A. Rezgui, N. Davis, Z. Malik, B. Medjahed, H. Soliman. CloudFinder: A System for Processing Big Data Workloads on Volunteered Federated Clouds. IEEE Transactions on Big Data. Accepted. 3) M.N. And Rahman, B. Medjahed, E. Orady, M.R. Muhammad, R. Abdullah, A.S.M. Jaya. Cloud Manufacturing: Issues and Opportunities. Journal of Advanced Manufacturing Technology (13 pages), 12(1), 2018. 4) A. Bouguettaya, M. Singh, M. Huhns, Q. Z. Sheng, H. Dong, Q. Yu, A.G. Neiat, S.Mistry, B. Benatallah, B. Medjahed, M. Ouzzani, F. Casati, X. Liu, H. Wang, D. Georgakopoulos, L. Chen, S. Nepal, Z. Malik, A. Erradi, Y. Wang, B. Blake, S. Dustdar, F. Leymann, M. Papazoglou. A Service Computing Manifesto: The Next Ten Years. 60(4), pp. 64-72, April 2017. 5) K. Hashmi, A. Alhosban, Z. Malik, and B. Medjahed. A Web Service Negotiation Management and QoS Dependency Modeling Framework. 7(2), Article 5, May 2016. 6) Z. Malik, B. Medjahed, A. Rezgui. sCARE: Reputation Estimation on the Uncertain Service Web. 16(1), Article 7, February 2016. 7) I. Benamor, S. Benbernou, M. Ouziri, Z. Malik, B. Medjahed. Discovering Best Teams for Data Leak aware Crowdsourcing in Social Networks. 10(1), Article 2, February 2016. 8) A. Alhosban, K. Hashmi, Z. Malik, B. Medjahed, S. Benbernou. Bottom-up Fault Management in Service-based Systems. 15(2), Article 7 (40 pages), June 2015. 9) S.-E. Tbahriti, B. Medjahed, C. Ghedira, M. Mrissa. IEEE Transactions on Services Computing. 10) M. Duran, M. Hoft, D. Lawson, B. Medjahed, E. Orady. Urban High School Students' IT/STEM Learning: Findings from a Collaborative Inquiry and Design-Based Afterschool Program. 11) S.E. Tbahriti, C. Ghedira, B. Medjahed, M. Mrissa, D. Benslimane. How to Enhance Privacy within DaaS service Composition? 12) A. Alhosban, K. Hashmi, Z. Malik, B. Medjahed. MASC: Matching Alternative Services in the Cloud. 13) S.E. Tbahriti, B. Medjahed, C. Ghedira. Modeling and Respecting Privacy Specification when Composing DaaS Services. 14) A. Alhosban, K. Hashmi, Z. Malik, B. Medjahed. S2R: A Semantic Web service Similarity and Ranking Approach. 15) M. Barhamgi, C. Ghedira, D. Benslimane, B. Medjahed. An SOA-based Architecture to Share Medical Data with Privacy Preservation. 2(3), pages 11-26, August 2011. 16) Z. Malik, A. Rezgui, B. Medjahed, M. Ouzzani, A. K. Sinha. 4(3), pages 301-330, December 2010. 3(3), pages 206 – 222, September 2010. 18) Q. Yu, M. Rege, A. Bouguettaya, B. Medjahed, M. Ouzzani. 4(2), pages 63-79, June 2010. A Service-Oriented Framework for Controlling Invasive Species in Agriculture. 4(1/2), pages 34-41, January 2009. Dissemination Protocols for Event-based Service-Oriented Architectures. 1(3), pages 155-168, September 2008. The Collective Index: A Technique for Efficient Processing of Progressive Queries. 51(6), pages 662-676, November 2008. - Best Paper Award (Winner of the Computer Journal Wilkes Award for 2008). Deploying and Managing Web Services: Issues, Solutions, and Directions. 17(3), pages 537-572, May 2008. Self-Adapting Recovery Nets for Policy-Driven Exception Handling in Business Processes. 22(1), pages 1-44, February 2008. Context-Based Matching for Web Service Composition. 21(1), pages 5-37, February 2007. 25) B. Medjahed, A. Bouguettaya, B. Benatallah. Semantic Web Services: Issues, Solutions, and Applications (Editorial Introduction). Customized Delivery of E-Government Web Services. 20(6), pages 77-84, December 2005. A Multilevel Composability Model for Semantic Web Services. 17(7), pages 954-968, July 2005. A Dynamic Foundational Architecture for Semantic Web Services. 17(2), pages 179-206, March 2005. WebBIS: An Infrastructure for Agile Integration of Web Services. 13(2), pages 121-158, June 2004. Composing Web Services on the Semantic Web. 12(4), pages 333-351, November 2003. Organizing and Accessing Web Services on Air. 33(6), pages 742-757, November 2003. Business-to-Business Interactions: Issues and Enabling Technologies. 12(1), pages 59-85, May 2003. Infrastructure for E-Government Web Services. 7(1), pages 58-65, January/February 2003. 34(2), pages 56-64, February 2001. 1) M. Duran, M. Hoft, B. Medjahed, D. Lawson, E. Orady (editors). STEM Learning – IT Integration and Collaborative Strategies. Springer, ISBN 978-3-319-26179-9, 183 pages, January 2016. 2) B. Medjahed, A. Bouguettaya. Service Composition for the Semantic Web. Springer, ISBN: 978-1-4419-8464-7, 191 pages, February 2011. Analyzing and Preventing Data Privacy Leakage in Connected Vehicle Services. WCX19, SAE World Congress Experience, Detroit, Michigan, April 2019. - Trevor O. Jones Outstanding Paper Award. CrowdMashup: Recommending Crowdsourcing Teams for Mashup Development. The 16th International Conference on Service-Oriented Computing, ICSOC 2018, Hangzhou, China, November 2018. 3) H. Labbaci, B. Medjahed, Y. Aklouf. A Deep Learning Approach for Quality-Aware Long Term Service Composition. The 15th International Conference on Service-Oriented Computing, ICSOC 2017, Malaga, Spain, November 2017. 4) H. Labbaci, B. Medjahed, Y. Aklouf. Learning Interactions from Web Service Logs. 28th International Conference on Database and Expert Systems Applications, DEXA 2017, Lyon, France, August 2017. 5) H. Labbaci, B. Medjahed, F. Binzagr, Y. Aklouf. A Deep Learning Approach for Web Service Interactions. 2017 IEEE/WIC/ACM International Conference on Web Intelligence, WI 2017, Leipzig, Germany, August 2017. Secure and Privacy-Preserving Data Collection Mechanisms for Connected Vehicles. WCX17, SAE World Congress Experience, Detroit, Michigan, April 2017. 7) H. Labbaci, B. Medjahed, Y. Aklouf, Z. Malik. Follow the Leader: A Social Network Approach for Service Communities. The 14th International Conference on Service-Oriented Computing, ICSOC 2016, Alberta, Canada, October 2016. 8) N. Ammar, Z. Malik, B. Medjahed, M. Alodib. K-Anonymity-based Approach for Privacy Preserving Web Service Selection. International conference on Web Services, ICWS'15, New York, June 2015. - Best Student Paper Award. 9) A. Alhosban, Z. Malik, K. Hashmi, B. Medjahed. Integrating Fault Tolerance Method into Service-Oriented Computing. International IEEE Symposium on Service-Oriented System Engineering, IEEE SOSE 2015, San Francisco, pp. 161–168, April 2015. 10) K. Hashmi, E. Najmi, Z. Malik, B. Medjahed, A. Alhosban. Sentiment Analysis for Intelligent Ratings Management. The 11th ACS/IEEE International Conference on Compute Systems and Applications, AICCSA 2014, Doha, Qatar, pp. 389–396, November 2014. 11) K. Hashmi, E. Najmi, Z. Malik, A. Alhosban, B. Medjahed, A. Rezgui. Automated Negotiation Using Semantic Rules. International Conference on Services Computing, SCC'14, Alaska, pp. 536–543, June 2014. 12) S. –E. Tbahriti, B. Medjahed, C. Ghedira, D. Benslimane, M. Mrissa. Respecting Privacy in Web Service Composition. International conference on Web Services, ICWS'13, Santa Clara., June 2013. 13) A. Alhosban, K. Hashmi, Z. Malik, B. Medjahed. The 10th ACS/IEEE International Conference on Compute Systems and Applications, AICCSA 2013, Fes/Ifrane, Morocco, May 2013. 14) F. Khazalah, Z. Malik, B. Medjahed. Automatic Conflict Resolution in a CDSS. 24th International Conference on Scientific and Statistical Database Management (SSDBM), Chania, Crete, Greece, June 2012. 15) S.-E. Tbahriti, B. Medjahed, Z. Malik, C. Ghedira, M.l Mrissa. How to Preserve Privacy in Services Interaction. The 8th Intern. Symposium on Frontiers of Information Systems and Network Applications, Japan, March 2012. 16) S.-E. Tbahriti, M. Mrissa, B. Medjahed, C. Ghedira, M. Berhamgi, J. Fayn. 22nd International Conference on Database and Expert Systems Applications, DEXA 2011, Toulouse, France, August 2011. 17) S.-E. Tbahriti, B. Medjahed, Z. Malik, C. Ghedira, M. Mrissa. Meerkat–A Dynamic Privacy Framework for Web Services. 2011 IEEE/WIC/ACM International Conference on Web Intelligence, WI 2011, Lyon, France, August 2011. 18) A. Alhosban, K. Hashmi, Z. Malik, B. Medjahed. Assessing Fault Occurrence Likelihood for Service-Oriented Systems. International Conference on Web Engineering (ICWE 2011), Paphos, Cyprus, June 2011. 19) K. Hashmi, A. Alhosban, Z. Malik, B. Medjahed. WebNeg: A Genetic Algorithm based Approach for Service Negotiation. International conference on Web Services, ICWS'11, Washington D.C., July 2011. 20) B. Medjahed and Z. Malik. Bottom-up Fault Management in Composite Web Services. The 23rd International Conference on Advanced Information System Engineering, CAiSE'11, London, England, June 2011. 21) Z. Malik and B. Medjahed. Trust Assessment for Web Services under Uncertainty. 10th International Conference on Service-Oriented Computing ICSOC 2010, San Francisco, December 2010. Semantic Web Enabled Composition of Web Services. Ph. D. Dissertation, Department of Computer Science, Virginia Tech, May 2004. Concurrency Control for Nested Transactions. M. Sc. Thesis, Algiers University of Sciences and Technology (USTHB), September 1995. 1. David Shugars, University of Michigan-Dearborn (post-qualifying exam). 2. Hamza Labbaci, USTHB University, Algiers, Algeria (co-supervised with Dr. Youcef Aklouf). 3. Faisal Binzagr, University of Michigan-Dearborn. 1. Faisal Binzagr, University of Michigan-Dearborn (Graduated: Summer 2017). 2. Venkata Prasanna, University of Michigan-Dearborn (Graduated: December 2017). 3. Luke Duncan, University of Michigan-Dearborn (Graduated: May 2012). 4. Olu Obembe, University of Michigan-Dearborn (Graduated: May 2009). 5. Shamil Hadi, University of Michigan-Dearborn (Graduated: July 2008). 1. Ziyad Hailat, Wayne State University (Final Defense: July 2018). 2. Ahmad Nasser, University of Michigan – Dearborn (Preliminary Defense: December 2016). 3. Hanzhang Wang, University of Michigan – Dearborn (Final Defense: December 2017). 4. Wiem Mkaouer, University of Michigan – Dearborn (Final Defense: March 2016). 5. Khayyam I. Hashmi, Wayne State University (Final Defense: February 2016). 6. Fayez Saleem Khazalah, Wayne State University (Final Defense: July 2015). 7. Chao Zhu, University of Michigan – Dearborn. (Final defense: September 2014). 8. Amal Alhosban, Wayne State University. (Final defense: July 2013). 1. Alex Melville, University of Michigan – Dearborn, April 2017. 2. Yarong Gu, University of Michigan – Dearborn, April 2017. 3. Rafi Almhana, University of Michigan – Dearborn, November 2016. 4. Fun Jiregesi, University of Michigan – Dearborn, November 2016. 5. Xianying Liu, University of Michigan – Dearborn, November 2015. 6. Sania Halawi, University of Michigan-Dearborn, December 2012. 7. Nan Wang, University of Michigan-Dearborn, August 2012. 8. Viktor Aboyan, University of Michigan-Dearborn, February 2010. 9. Lilit Yenokyan, University of Michigan-Dearborn, October 2009. 10.Rafayel Bezirganyan, University of Michigan-Dearborn,, March 2009. 11.Hyun Jeong Seok, University of Michigan-Dearborn, January 2009. 12.Anshuman Sharma, University of Michigan-Dearborn, June 2006. 13.Yuri Siradeghyan, University of Michigan-Dearborn, May 2006. 14.Goke Ojewole, University of Michigan-Dearborn, December 2005.
o Supervised more than 70 graduate students for their M.Sc. projects (CIS 695). More details can be found here. o Supervised more than 15 undergraduate students in various sponsored projects. More details can be found here. o Track Chair (Advances in Web Technologies: Semantics and Future Internet), 13th ACS/IEEE Inter. Conf. on Computers, Systems, and Applications (AICCSA 2016). o Track Chair (BPM, Web Services, SOA), 12th ACS/IEEE Inter. Conf. on Computers, Systems, and Applications (AICCSA 2015). o Track Chair (Databases and Data Mining), 8th International Conference on Innovations in Information Technology (IIT 2012). o Program Vice-Chair, International Conference on Mobile Web Information Systems, MobiWIS-2011. o Tutorial co-Chair: IEEE Asia-Pacific Services Computing Conference (APSCC 2009). o Publicity co-Chair: International Conference on Service-Oriented Computing (ICSOC 2008). o Editorial Board Member, International Journal of Web Science. o Guest Editor (with A. Bouguettaya and B. Benatallah) of a special issue on Semantic Web Services: Issues, Solutions, and Applications, ACM Transactions on Internet Technology, 8(1), November 2007.
o Intern. Conference on Service-Oriented Computing (ICSOC): 2017, 2016, 2015, 2008, 2007, 2006, 2005.
o Intern. Conference Database and Expert Systems Applications (DEXA): 2018, 2017, 2016, 2015, 2014, 2013, 2012, 2011, 2010, 2009.
o IEEE International conference on Cloud Computing (CLOUD): 2016, 2015, 2014, 2013, 2012, 2011.
o IEEE/WIC/ACM International Conference on Web intelligence (WI): 2017, 2016, 2014, 2013, 2012, 2011.
o Service-Oriented Computing and Applications (SOCA): 2015, 2014, 2013, 2012, 2011, 2009.
o Intern. Symposium on Programming and Systems (ISPS): 2015, 2013, 2011, 2009, 2007, 2005.
o Intern. Conference on Web Information Systems Engineering (WISE): 2013, 2012, 2011, 2009, 2008.
o And a total of more than 100 conferences and workshops. More details can be found my here.